We present a new approach to designing concretely efficient MPC protocols with semi-honest security in the dishonest majority setting. Motivated by the fact that within the dishonest majority setting the efficiency of most practical protocols does not depend on the number of honest parties, we investigate how to construct protocols which improve in efficiency as the number of honest parties increases. Our central idea is to take a protocol which is secure for \(n-1\) corruptions and modify it to use short symmetric keys, with the aim of basing security on the concatenation of all honest parties’ keys. This results in a more efficient protocol tolerating fewer corruptions, whilst also introducing an LPN-style syndrome decoding assumption. We first apply this technique to a modified version of the semi-honest GMW protocol, using OT extension with short keys, to improve the efficiency of standard GMW with fewer corruptions. We also obtain more efficient constant-round MPC, using BMR-style garbled circuits with short keys, and present an implementation of the online phase of this protocol. 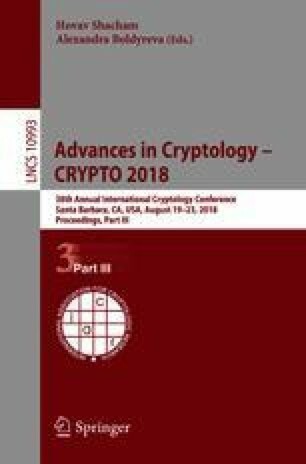 Our techniques start to improve upon existing protocols when there are around \(n=20\) parties with \(h=6\) honest parties, and as these increase we obtain up to a 13 times reduction (for \(n=400, h=120\)) in communication complexity for our GMW variant, compared with the best-known GMW-based protocol modified to use the same threshold. C. Hazay—Supported by the European Research Council under the ERC consolidators grant agreement No. 615172 (HIPS), and by the BIU Center for Research in Applied Cryptography and Cyber Security in conjunction with the Israel National Cyber Bureau in the Prime Minister’s Office. E. Orsini—Supported in part by ERC Advanced Grant ERC-2015-AdG-IMPaCT. P. Scholl—Supported by the European Union’s Horizon 2020 research and innovation programme under grant agreement No. 731583 (SODA), and the Danish Independent Research Council under Grant-ID DFF-6108-00169 (FoCC). E. Soria-Vazquez—Supported by the European Union’s Horizon 2020 research and innovation programme under the Marie Skłodowska-Curie grant agreement No. 643161, and by ERC Advanced Grant ERC-2015-AdG-IMPaCT.